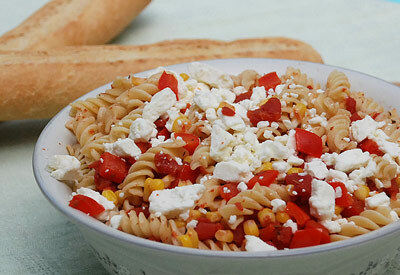 In a saucepan, combine tomatoes (including juice), corn, red pepper and oregano, bring to a boil. Reduce heat and simmer 5 minutes. Remove from heat and pour into a colander to drain juice; discard juice. Pour vegetables over pasta and toss gently to coat. Spoon into serving dish and top with feta cheese.